Victoria decided to take up the violin when she was five years old, after she won one at a silent auction. She began playing that same year, taking part in Kadima’s music program at Van Gogh Elementary School. Within two years, Victoria began taking lessons with her friend, confidant and mentor, Beth Elliott. This past year she added lessons with her technical guru and music conscience, Eric KM Clark. Their expert guidance and shared passion for music greatly helps Victoria on her musical journey. 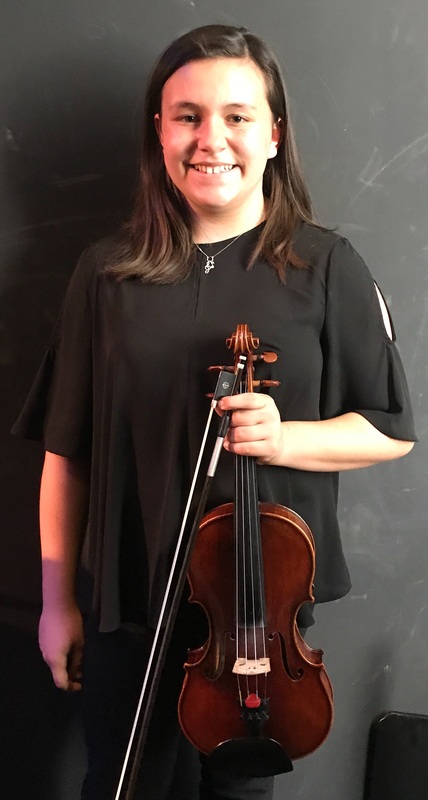 Victoria plays in the Kadima Conservatory Philharmonic, Senior Philharmonic, and is a member of the master class of Beth Elliott and Eric KM Clark. Her proudest moment is when she was honored with the Jeremy & Wendy Phillips Scholarship. This award is helping to enable Victoria pursue her dream of one day going to college to study music performance. When she is not making music, Victoria enjoys spending time with her family and three dogs, Maggie, Peanut and Gracie. She also loves watching movies and cooking shows, and can often be found in the kitchen making breakfast, preparing her lunch, or helping with the family dinner. She is also an active member of the Girl Scouts, where she has reached the level of Cadette. Victoria is extremely grateful for the time and support provided to her by her family and friends. She would like to thank Beth Elliott and Eric KM Clark for continuously and creatively challenging her to realize her true potential as a musician, the Phillips family for their generous educational support, and everyone at Kadima Conservatory of Music for providing a unique and nurturing environment where she can grow as a musician.